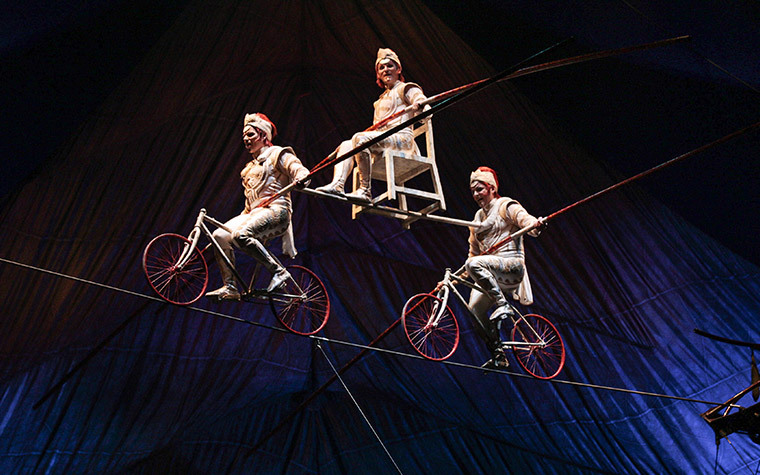 One of the many nail-biting acts in KOOZA is the high wire act. Twin high wires are suspended 4.5 metres and 7.6 metres above the stage. The four tightrope walkers perform feats in the air that most of us would find difficult to do on the ground. Three of the performers are the Quiros brothers who come from a long line of Spanish circus performers. The Quiros Family Circus was founded by their great-great-great-great grandfather. Their 99 year old grandfather is now the oldest living member of the family and he has lived in the circus all of his life. Now his grandsons are continuing the tradition with Cirque du Soleil. In order to ensure a solid education, the boys were sent to Madrid at an early age to live with their grandparents, and attend school full-time. They spent every holiday with their family at the circus, and so were exposed from a very young age to the world under canvas. 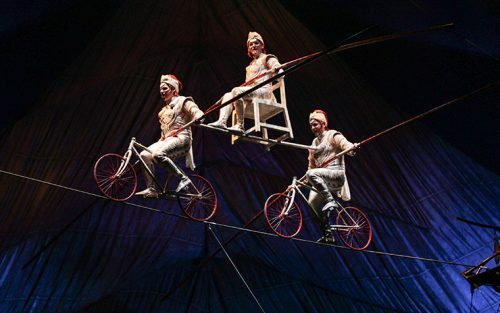 Their circus careers began from around 12 years old when they began training in a number of circus arts – juggling, acrobatics, unicycle, low wire, and so on. 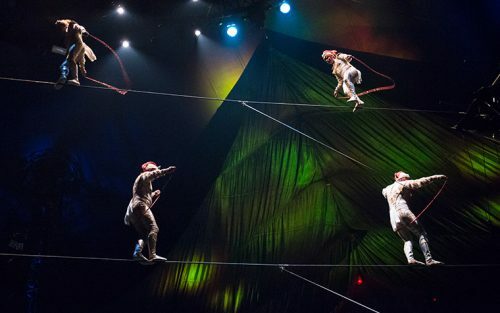 After some years, their father felt that it was important that they had one solid number that would allow them to preform in circus rings across the globe. He focused their training on only one number – a V-shaped low wire at 1.8 metres from the piste. They developed a very technically complex routine, with runs, jumps, forward and back somersaults, and so on. The most dangerous number was the front somersault, since they could only see the wire a fraction of a second before their landing! The boys never worked with a net; it was a matter of pride for them. A chance meeting with a Cuban high wire artist, el Gran Zapaton changed the brothers’ lives. When he saw their act, he told their father, “Don’t let them work so close to the ground, they need to be on a high wire!” The wire was raised to 9 metres, and the boys never looked back. The brothers were quickly hired by Gran Circo Mundial, Spain’s premiere circus company, and their career was off and running! They joined KOOZA when the show first premiered in 2007 and are now looking forward to performing for Australian audiences. KOOZA is on its way to Australia for an August 25 Premiere in Sydney.